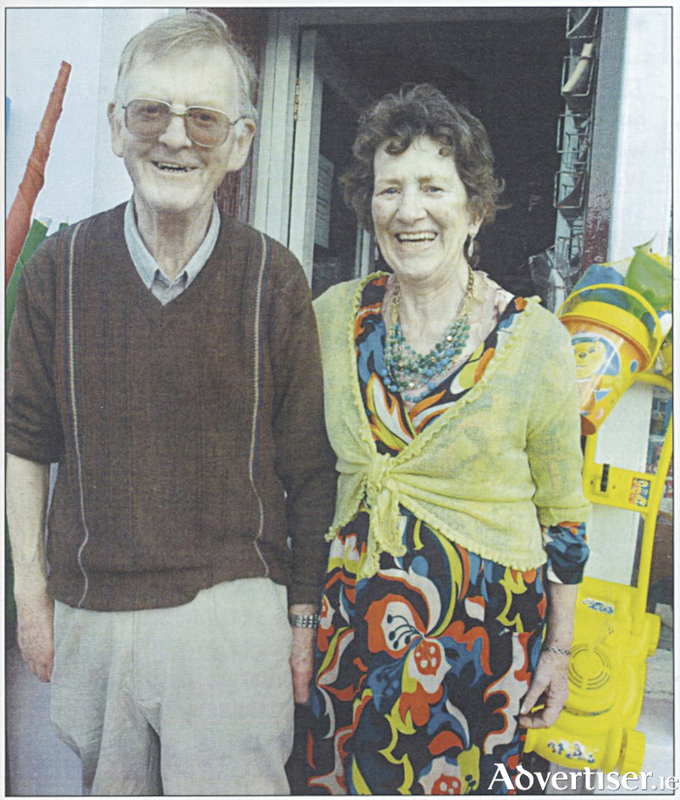 Liam and Kitty Gillane outside their renowned shop before it closed last Summer. (Photo Jonathon Davis). Even on Christmas morning, if Santa had forgotten that one important item, batteries for the impotent toy lying motionless on the floor at home, or a packet of cigarettes to tide mum and dad over the holiday, you could knock on the front door of Gillanes, after Mass, and Kitty or Liam would gladly sort you out. Their shop, Gillanes of the Square, Gort, was an Aladdin’s cave. From floor to ceiling, and every square inch of the cement floor, was packed with household goods. With the exception of a narrow passage, and a small section in front of the counter for customers, even the floor was stacked with 8 stone bags of sugar, 4 stone bags of flour, wooden tea chests, chicken nuts and other animal food stuffs. Hooks hung from the ceiling, and everything that could hang was hung. On the counter stood small glass display cabinets, sheets of brown paper that were used to wrap that loaf of bread, and a weighing scales and weights (sometimes substituted with a pound of butter ), for measuring out all the products that were delivered in bulk. Outside was an equally important space to display bags of new potatoes, cabbages, turnips, and other vegetables all sourced from local farmers together with any other product that could withstand the odd shower of rain, including bags of colourful beach balls and buckets and spades in the summer. Throughout its lifetime, and Gillanes passed down through the same family for at least 150 years, the shop maintained the old-style counter service. Because of its ideal location in The Square near the church, there are few people in south Galway who did not cross its threshold at one time or another. The service from the Gillanes extended way beyond the counter of his shop, and reached out to those living in remote rural areas of south Galway and north Clare. His travelling shop was a life-line, and a source of news and gossip that enlivened the lives of those without transport, or those living alone. Local weekly newspapers were brought, and human contact was made. It was common too, not so long ago, for shopkeepers to combine domestic duties with commercial. A small window into the kitchen at the back of the shop was a convenient way of knowing when a customer had entered. Usually, at this busy time of year, Liam would be handed a list of items wanted, and the customer, would wait chatting away while Liam went around the shop getting the required items together. Sometimes, if it was a particularly long list, a cup of tea would be offered, a chair to sit on, followed by a generous slice of Christmas cake. An important feature of Gillanes was the bakery out the back. Billy Kilroy recalls how Liam’s father Mick, ‘spent all his time making dough for the grinders, with great skill.’ These were big long loaves that were sold in sections. They were baked daily in ovens that appeared like holes in the wall, and distributed to other shops and boarding houses in the town. A speciality were the Gilliane’s Barm Bracks, not only at Halloween but for Augusta Lady Gregory, who arrived at the Abbey Theatre, on the first night of a new play, with an enormous brack left in the theatre’s Green Room to be hacked and eaten by the actors. The baking tradition was continued by Liam into the early seventies when many small local bakeries succumbed to the bigger regional and national brands. Gillanes , without the bakery, continued until March last year, when sadly the ‘Closing down’ sign went up. Liam’s health went into decline and Kitty needed to devote her time to his care. The last surviving independent grocery, and one of the oldest shops in The Square, finally closed its doors the following June. NOTES: Guire - celebrating 40 years as Gort’s community magazine, edited by Toni Kelly, is now on sale at 5 euros. Do women change after marriage?